Ashes have been prepared and positioned on the altar at Most Holy Trinity Catholic Church, Huntingdon, in preparation for Ash Wednesday observances today, Wednesday, March 6. Today, Ash Wednesday, March 6, marks the beginning of the 40-day observance of Lent a period of introspection and recommitment for Christians around the world. Preceded by Mardi Gras (literally translated “Fat Tuesday”), Shrove Tuesday or Fasnacht Day, the Tuesday prior to Ash Wednesday was developed as a way to celebrate ahead of the solemn observances and to use up more decadent ingredients cast aside during Lent. While not universally practiced throughout all of the Christian faith traditions, the practice of setting aside the weeks preceding Easter is observed by Catholics and Protestants alike with many beginning their Lenten journey with the imposition of ashes. The ashes administered to the foreheads of the faithful on Ash Wednesday are the remains of the palms from the previous year’s Palm Sunday service, a stark reminder of the celebration which met Jesus’s entry into Jerusalem one week before his betrayal and crucifixion. Ashes are also symbolic of repentance throughout the Bible. While there is no clear scriptural representation of Ash Wednesday or Lent, the practice traces back to the earliest days of Christianity when the Lenten period was also a time of preparation for those seeking to be baptized into the faith, which would take place Easter Sunday. Ash Wednesday continues to be a day that draws many faithful to church. For this reason, many Christian faith traditions do reflect some sort of Lenten observance, whether it be fasting, special services, Bible studies or a call to introspection. Christine emphasized that Lent is not intended to be a time to strive for perfection through adherence to self-imposed rules. — St. John’s Episcopal Church, Huntingdon, at noon and 7 p.m.
— Cassville Lutheran Church, 309 Seminary St., Cassville, at 6:30 p.m.
— 12th Street United Methodist Church, Huntingdon, at 7 p.m.
— Alexandria Presbyterian Church at 7 p.m.
— Shirleysburg United Methodist Church at 7 p.m.
— St. Matthew Lutheran Church, Entriken, at 7 p.m. The offering will benefit the Southside Elementary School backpack program. — St. Luke Lutheran Church, Mount Union, at 7:30 p.m. The first day of the Orbisonia Senior Center welcomed roughly 15 people throughout the day. Steve Scott, standing, was joined by, from the left, Pat Berrier, Kay Hamman, Evelyn Booher, Betty Bolinger, Betty Ramsey, Linda Scott (hidden), Linda Wakefield and Linda Clark. 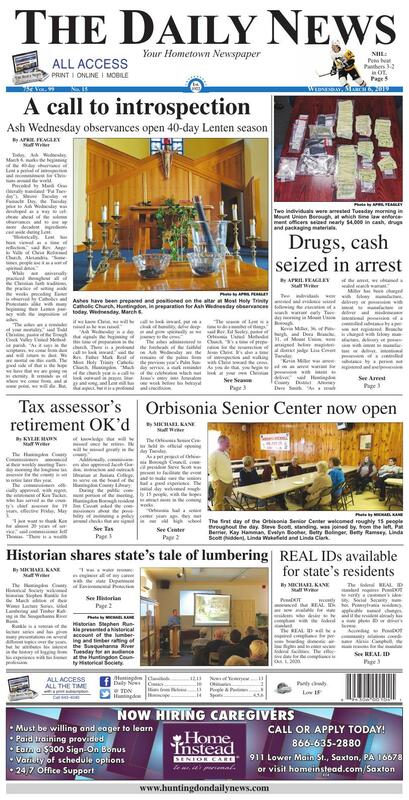 The Orbisonia Senior Center held its official opening day Tuesday. As a pet project of Orbisonia Borough Council, council president Steve Scott was present to facilitate the event and to make sure the seniors had a good experience. The initial day welcomed roughly 15 people, with the hopes to attract more in the coming weeks. Community member Pat Berrier was excited to be part of the opening day festivities, as well as being part of the discussion of what the seniors plan to do with the new facility. Berrier commented that her vision of the senior center is to be more of a social gathering, as opposed to what many would associate with it. “When I worked at (Community State Bank), I would go and talk at senior centers and it was very interesting that each one had a different climate. I went into one and they were whiners and complainers, and then I went into the next one they talked about how they were going to do this and that and it just felt good to be there,” said Berrier. The tone of the environment was excitement from the people who came throughout the day. Many members came together and enjoyed refreshments and spoke about their plans for the center. Berrier was most excited for the chance for community members to learn more about their town’s history. Scott remarked on the businesses and community members that helped to make the day possible. The Orbisonia Senior Center will be open from 9 a.m. to 1 p.m. Tuesdays and Thursdays. For more information on the senior center call the Orbisonia Borough office at 447-3255. Historian Stephen Runkle presented a historical account of the lumbering and timber rafting of the Susquehanna River Tuesday for an audience at the Huntingdon County Historical Society. The Huntingdon County Historical Society welcomed historian Stephen Runkle for the March edition of their Winter Lecture Series, titled Lumbering and Timber Rafting in the Susquehanna River Basin. Runkle is a veteran of the lecture series and has given many presentations on several different topics over the years, but he attributes his interest in the history of logging from his experience with his former profession. Tuesday’s presentation was one of many within Runkle’s repertoire of historical accounts. Runkle told his audience about the impacts of the lumbering industry on Pennsylvania, and how within 100 years over 70 percent of the state’s forests had been clear cut for sale and processing. Runkle explained the different ways that logs were taken to market on the Susquehanna River basin during the height of the logging era. “When the early settlers came down into the frontier, they were really interested in farming. They tried to clear the forest. They, of course, built the buildings they needed to build, the log cabins and the barns, but then they had a surplus of logs and mainly they just burnt them. However, some of the more astute farmers realized if they could get the logs down market, down stream, generally to places like Harrisburg, down the Susquehanna River, and that timber was worth some money, but the problem was how would they get it down there,” said Runkle. There were several interesting facts about the loggers who worked in the camps all around the state. Runkle asked the audience about the nickname given to the loggers. “This might surprise you, they called them ‘wood hicks.’ They didn’t call Paul Bunyan or loggers, they called them wood hicks. They were the grungiest and the smelliest guys you would ever run into, because they never took a bath. The logging camps had no bath facilities and they rarely changed their clothes,” he said. The detailed lecture followed the logging trail from the headwaters of the Susquehanna River, and explained the many different facets and improvements of the logging industry over the course of the century it was most practiced. The industry saw the change of floating logs singularly down the river, to lashing them together in rafts, and finally being taken by canal boat and eventually by railroad. The increase of sawmills spurred new technology, from the traditional water-powered mills to the steam-powered mills with large circular saws and bandsaws that ran all day and all night, which increased the production. Runkle concluded his presentation by showing areas like the Pennsylvania Grand Canyon that was once clear cut due the logging industry. Where a railroad once stood is now a rails to trails site with lush forest around it. “We’re back to 60 percent forested from 30 percent. Let’s not let it get back that far again. Let’s use modern conservation practices to conserve our forests and I think we’re doing a pretty good job today,” said Runkle. The Huntingdon County Commissioners announced at their weekly meeting Tuesday morning the longtime tax assessor for the county is set to retire later this year. The commissioners officially approved, with regret, the retirement of Ken Tucker, who has served as the county’s chief assessor for 19 years, effective Friday, May 3. Additionally, commissioners also approved Jacob Gordon, instruction and outreach librarian at Juniata College, to serve on the board of the Huntingdon County Library. During the public comment portion of the meeting, Huntingdon Borough resident Jim Cassatt asked the commissioners about the possibility of instituting a policy around checks that are signed by the county, but are never cashed, causing the county to pay to stop payment. Cassatt also asked the commissioners about $1.3 million in funds they were to receive for Children and Youth Services during the budget impasse of the 2014-15 fiscal year that was to be paid during the 2016 budget year or later. Cassatt said if that money would have been used wisely when it was received, perhaps the county wouldn’t have needed to take out a Tax Application Notice (TAN) for $1.71 million. Thomas told Cassatt they would have to do research on when the county received the money and what exactly was done with the money that was received. Two individuals were arrested Tuesday morning in Mount Union Borough, at which time law enforcement officers seized nearly $4,000 in cash, drugs and packaging materials. Two individuals were arrested and evidence seized following the execution of a search warrant early Tuesday morning in Mount Union Borough. Kevin Miller, 36, of Pittsburgh, and Dora Branche, 31, of Mount Union, were arraigned before magisterial district judge Lisa Covert Tuesday. Miller has been charged with felony manufacture, delivery or possession with intent to manufacture or deliver and misdemeanor intentional possession of a controlled substance by a person not registered. Branche is charged with felony manufacture, delivery or possession with intent to manufacture or deliver, intentional possession of a controlled substance by a person not registered and use/possession of drug paraphernalia. “Bail for Mr. Miller was established at $250,000 straight,” Smith said. Both Miller and Branche are confined to the Huntingdon County Jail. Smith added that all parties are innocent until proven guilty in a court of law. “The investigation is ongoing and will continue,” he said. Members of the state Attorney General’s Office, the Huntingdon County Drug Task Force, Mount Union Borough Police Department and the Huntingdon Borough Police Department assisted in the search of the Hartman Village, Mount Union, residence just after 7 a.m. Tuesday. The evidence collected will be sent to a lab for further testing. Statewide, the trends seem to indicate that the number of cases involving heroin have shown a slight decline while there is an uptick in the amount of crack cocaine, cocaine and meth being abused. Preliminary hearings for both Miller and Branche have been scheduled for 8:30 a.m. Wednesday, March 13. PennDOT recently announced that REAL IDs are now available for state residents who desire to be compliant with the federal standard. The REAL ID will be a required compliance for persons boarding domestic airline flights and to enter secure federal facilities. The effective date for the compliance is Oct. 1, 2020. The federal REAL ID standard requires PennDOT to verify a customer’s identity, Social Security number, Pennsylvania residency, applicable named changes, and if the resident already has a state photo ID or driver’s license. According to PennDOT community relations coordinator Alexis Campbell, the main reasons for the mandate is for residents to be able to gain access to airplanes and government buildings after the effective date. “The main reason is if people want to continue to use their state driver’s license to board domestic flights or enter secure federal buildings or military building, then their going to need either a REAL ID, passport or another federally accepted form of ID after Oct. 1, 2020. If people don’t fly, if they have a passport or they have some other ID that may work, they might not need to get a REAL ID right now, but if you want to continue to use your driver’s license to do those things you should get one,” said Campbell. Residents will have three options for obtaining a REAL ID which include online ordering if they have been pre-verified, by visiting a PennDOT Driver’s License Center to have their documents verified and imaged which will be mailed within 15 business days, or to visit one of the 12 PennDOT REAL ID centers to receive same-day over-the-counter service. According to Campbell, all driver’s licenses that were initially issued after 2003 should have been pre-verified, and would allow customers to order online via the PennDOT website. The cost of REAL ID for first-time users is a one-time fee of $30 and a driver’s license renewal of $30.50, which will add an additional four years to existing license terms. According to Campbell, all licenses renewed after obtaining REAL ID status will continue to hold the designation. However the switch to REAL ID is not required for all residents. “The legislation that was passed that authorized us to offer REAL IDs was specific in saying that it’s up to each person if they want to get a REAL ID or not. In Pennsylvania it’s optional, it’s a federal law, but each state implements it in their own way. In other states, they may require you to get a REAL ID, but here it’s optional,” said Campbell. For more information or to find a REAL ID Center, visit www.penndot.gov/REALID.